« What is Steampunk Food? That frank’s gotta pickle and a cheese in the middle, and a bacon on the outside! If you’re ever in the Bronx, and you happen to see a brightly dressed man digging around in the dirt, don’t be alarmed. That’s my friend Jason. He speaks for the trees. He’s been journeying to the Bronx on his days off to care for the neglected city greenery. You can read about his adventures on his blog here. Jason, like me, is originally from the Midwest. Also like me, when he was growing up, Jason would often travel around with his mother to local flea markets and garage sales. I think rummage sales might be the best in the Midwest. Someone suddenly decides to throw open their barn, revealing long-lost, dust-covered treasures that can be bought for a nickel or a dollar a piece. Although, what qualifies as a treasure is different from one person to another. Jason brought me a find from long ago: a set of matchbooks, printed in 1963, adorned with recipes using Hunt’s Tomato Sauce. You can see more of the collection on my Tumblr blog here. The matchbooks have recipes on the inside! When I handle them, open them, pull them apart to examine the recipes, I think about tearing off each match and striking it, lighting each until the recipe is revealed. Ripping off the last blue-tipped match and then cooking myself a Hunt’s adorned treat. The vision brings to mind chain-smoking while stirring tomato sauce covered pork, which I supposed is exactly what we were doing in 1963. 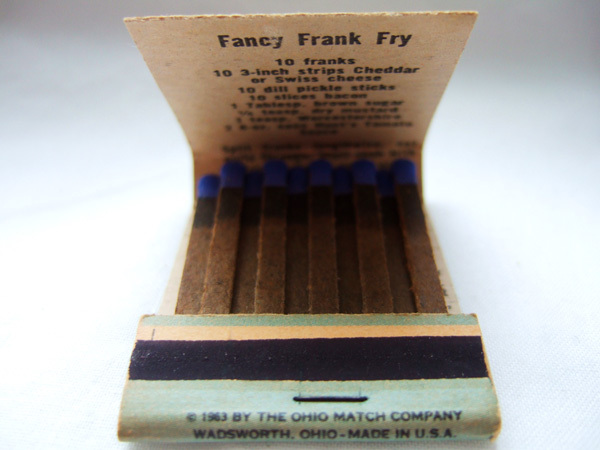 As Jason and I looked over the recipes, there was one that caught my eye: The Fancy Frank Fry. 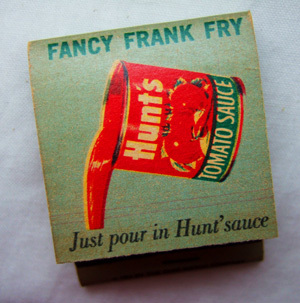 From Hunt’s recipe matchbooks, 1963. Split franks lengthwise, not quite through. Stuff each with a strip of cheese and a pickle stick. Wrap slice of bacon around each frank. Place in a cold skillet, fry over medium heat, turning often, until bacon is crisp on all sides; pour off excess fat. Add remaining ingredients; simmer 25 to 30 minutes. Makes 4-6 servings. I cooked this recipe in two phases: first, I took the filled and wrapped hotdogs and fried them, plopped two of them on buns, and my boyfriend and I devoured them. Golly were they good. The cheddar had liquified in the middle, creating a taste and texture that far rivaled any store-bought pre-cheese-filled hotdogs. The franks were Nathan’s, too, which were worth the money. And the crispy bacon on the outside! Salty, acid from the pickle, fatty…oh man oh man oh man. A great way to ruin a good hot dog. And then I dumped the tomato “sauce” on the rest of the dogs in the skillet. 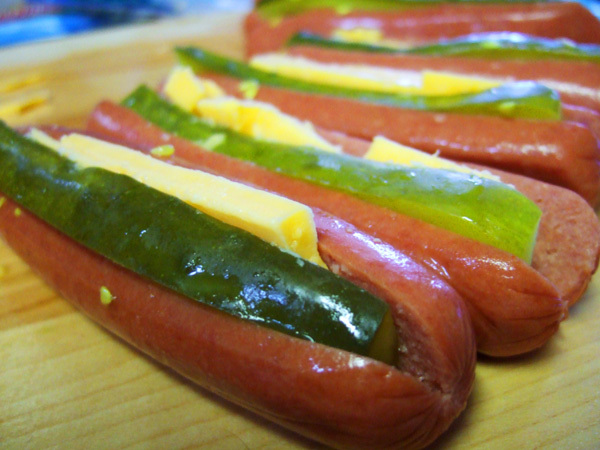 This recipe had two problems which I anticipated in advance: one, some of the hot dogs split during cooking, causing them to bleed out their cheese-filled guts into the skillet. 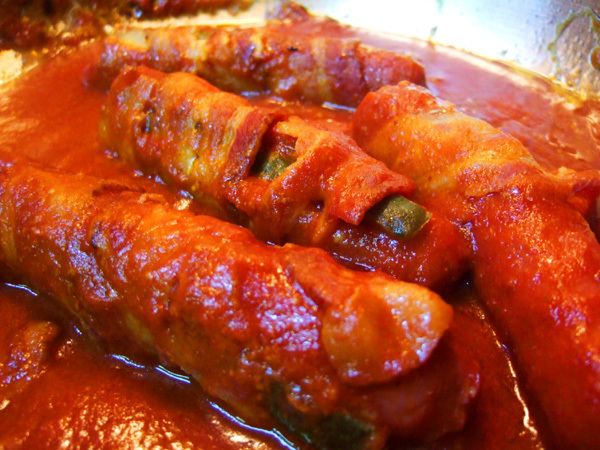 Two: cooking the hotdogs in the sauce made the bacon soggy! The pickle, too, was warm and floppy. And who wants that? After simmering for a half an hour, the dogs were flaccid and unappealing–although they were happily devoured by my coworkers the next day. That’s what coworkers are for: gratefully devouring your failings. But I think this recipe could be better. Time to retronovate. Let’s cut the unnecessary tomato sauce out of this recipe–sorry Hunt’s. Split the hotdog and stuff a strip of cheddar in there. Wrap it in bacon and fry it until it’s crispy on all sides. Put it on a bun and top with chopped dill pickles and BBQ sauce. Voila. 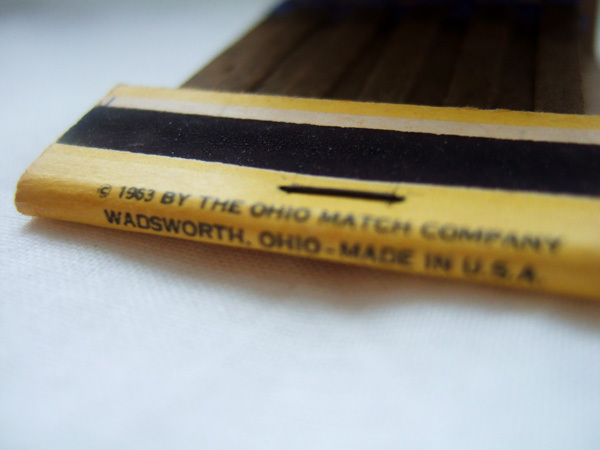 I’m going to call it “The Ohio Dog,” after the place where these matchbooks and I were born. First time commentor and visitor! I stumbled on your site from a smalll snippet I saw on TV and thought your ideas for food were fantastic! I think it’s soo interesting! 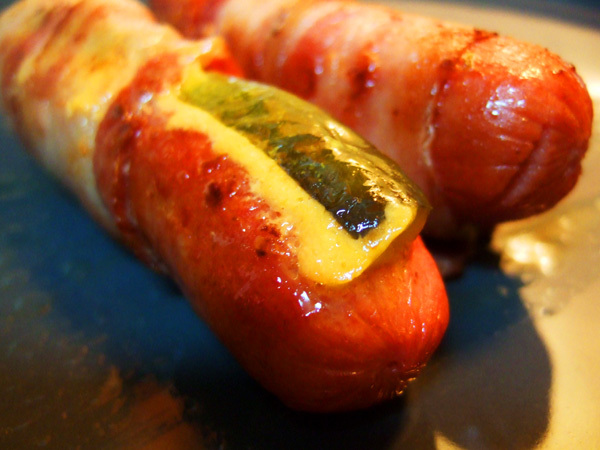 My boyfriend loves the hotdogs I make (he loves it fatty and greasey lol) and I think this cheese-stuffed-bacon hotdog is something he’d definately go for! Welcome Cathy!! Thanks for stopping by! And I’m sure your boyfriend will loove these. Mine did! I have made these for years, in Michigan. I too forget the sauce. I put the dogs all wrapped up and stuffed on a cookie sheet and broil them until I get most of the bacon crispy.